Last week I discussed the importance of using an eye cream. This week I am going to share a super simple hydrating DIY eye cream that is perfect for those of you would would rather DIY versus buy. Both avocado oil and shea butter are known for their hydrating and moisturizing properties, making it the perfect marriage of ingredients for the delicate under eye area. It is a natural source of Vitamins A, D and E.
It is easily absorbed into the skin and can help with regenerating and softening of the dry eye area. Contains potassium, which can help with the growth of new cells. It is a natural fat that is extracted from the nut of the African shea tree, which is very hydrating. It is widely used in skin care to reduce the appearance of fine lines, scars and stretch marks. It melts when it comes in contact with your skin (if you buy the real stuff you will see what I mean) and it is instantly absorbed, without making you feel like a greasy mess. Restores the natural suppleness of your skin. %100 Pure Shea Butter *Make sure you read the back label before you purchase. You want to make sure the only ingredient listed is shea butter. *You can find both of these ingredients at a health food store in the beauty section. Or you can purchase them here and here. 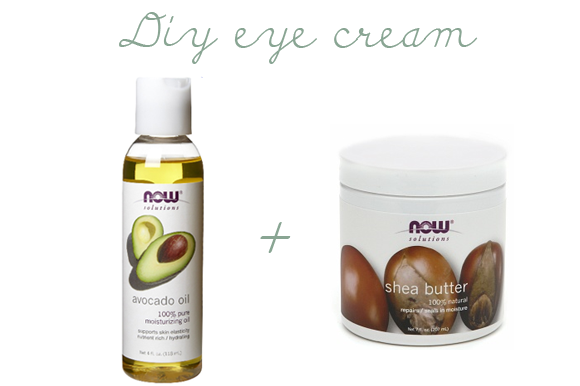 Take a few drop of avocado oil and gently massage under each eye until fully absorbed. Finish by applying a thin layer of shea butter on top. Gently massage into your skin until absorbed. So easy and super cost effective! You can use this DIY version morning and night. Please come back and let me know what you think if you end up trying this out. This is right up my alley. I love DIY skin care! Sounds fab! What are some others uses for the two ingredients? Awesome! I think I can manage those ingredients! Thanks friend! And then you eat the avocado. ;) I actually have used avocado oil before on my skin and it really did make a huge difference! Once I run out of my eye cream I'm going to give this one a try! Seriously you are the best resource for all things skin care and DIY skin care! This sounds fabulous!! I will be trying this for sure! Thanks for sharing! Love your blog!!!! Terrific! Need to grab these ingrediants next time I am at the health store. Love that it doesn't call for alot of stuff! Brooke- Great question! Both have so many wonderful individual uses. Shea butter can help with stretch marks, scars, wrinkles etc and avocado oil is one of the most moisturizing fruit oils there is! It is a perfect oil for super dry skin, you could rub it on dry elbows or feet by itself or mix with shea butter for added benefits. this is awesome! what a wonderful idea. i'm so excited to do this :) thanks, lady! I was just saying to someone a few months ago that I needed to start wearing eye cream, i'm going to have to try this. Me and my crow's feet officially love you. Thank you for this! i just bought eye cream over the weekend and spent a fortune! once it runs out i'm definitely trying this! I just finished my little jar of eye cream! I think I need to try this! Thanks for all the wonderful tips! It's so weird... I was gonna email you and ask you about eye products right when you did this post. I went out and bought those products and I have a question. The shea butter is not creamy at all. It's hard as a rock. The package says it's hard as a rock and it also says not to nuke it as their is foil in the container. It tells me to scoop out a portion and warm it in a bowl but (a) that seems like a lot of work every night and (b) how do you scoop out a piece of a rock? What do you do? Thanks!!!! Rachael- Yes real shea butter comes super hard! You bought the right stuff don't worry :) You can do two things...before applying warm up the shea butter in a cup of warm water for a few minutes (maybe do while washing your face). You don't need it to be completely melted to apply. The second thing you can do is mix the two ingredients in an small airtight container (you can find these at the dollar store). You will need to slightly melt the shea butter for this, but once mixed with the liquid avocado oil it will not return to the hard state it was previously. Make enough to last you a few months. Hope that helps! Is there another comparable oil to avocado? I am allergic to avocado when I eat it but it may be ok in a cream. Thanks so much for answering Rachael's comment. I wondered if the 2 could just be combined and stored in the same container for a quick apply! LOVE your blog, keep the great ideas coming! Thanks for all your natural skin care advise... I'm loving it! I've really been wanting an eye cream recipe, but I'm allergic to avocados. Anything I can substitute it with? Thanks! Can you use this as an all over moisturizer or just around the eyes? Thank you! Do you use a "refined" or "coldpressed" avocado oil? I have a question for you. My avocado oil says to refrigerate after opening, so I'm wondering if you store it in the frig. after you've mixed them together or is refrigeration truly necessary? I love how wonderful this feels on my skin. I use the NOW brand which is %100 food grade and expeller-pressed. You do not have to refrigerate it, but it you do it may have added de-puffing benefits since it will be cold. Rachael, in case what she said about warming up the Shea butter, was confusing, she meant a water bath. Don't put the actual product in the water. Use a glass two cup measure (like pyrex) to put your butter in and put that whole thing in a couple inches of water in a saucepan over low heat. Stir with a wooden spoon until melted. Sorry if that was confusing or if I stepped on anyone's toes! informative post keep the good work like this awaiting for a new post keep sharing. I absolutely hate the smell of shea butter :( Is there a close substitute to it? Thanks! I have dark circles too and really bothering me a lot! Do you have any effective solution?